BEINN Á GHLO is a fine massif. It rises above Glen Garry in a series of stony peaks and ridges that swoop into wild country away to the east. 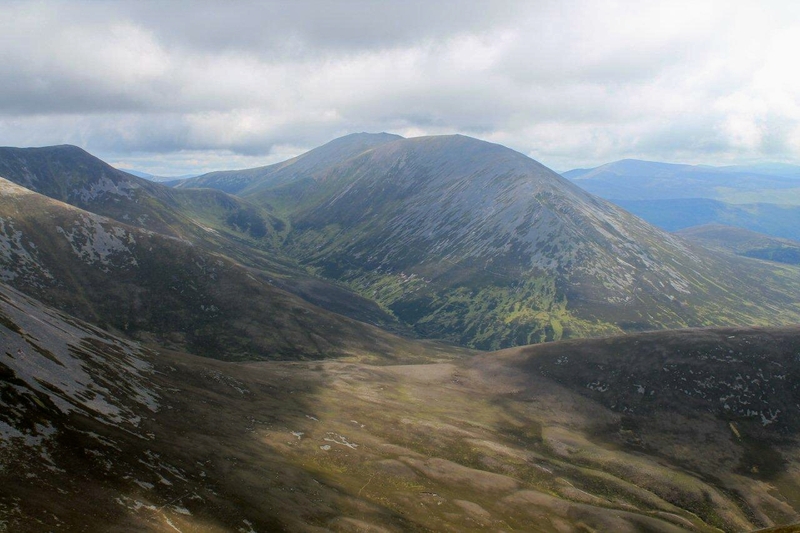 There are three Munros in this majestic group of hills – and when viewed from below they look like they mean business. 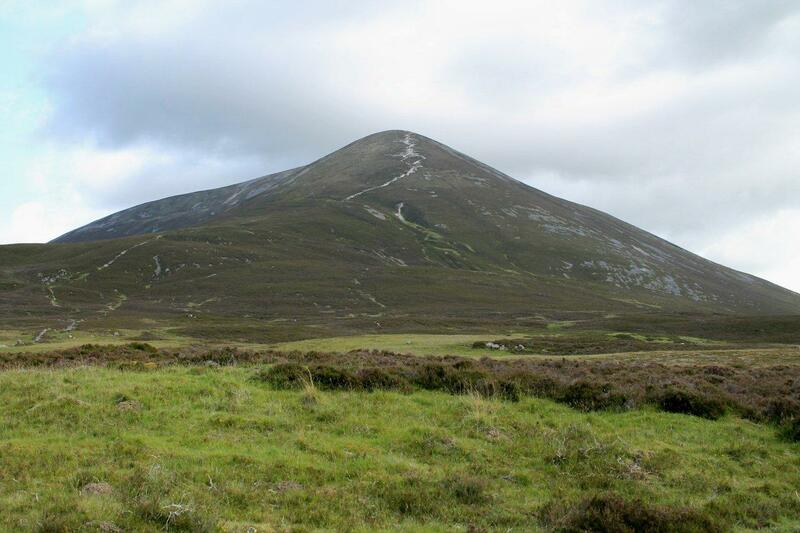 The first is Carn Liath, which at a steep 976m (3,202ft) is a breathless warm-up for mightier things. 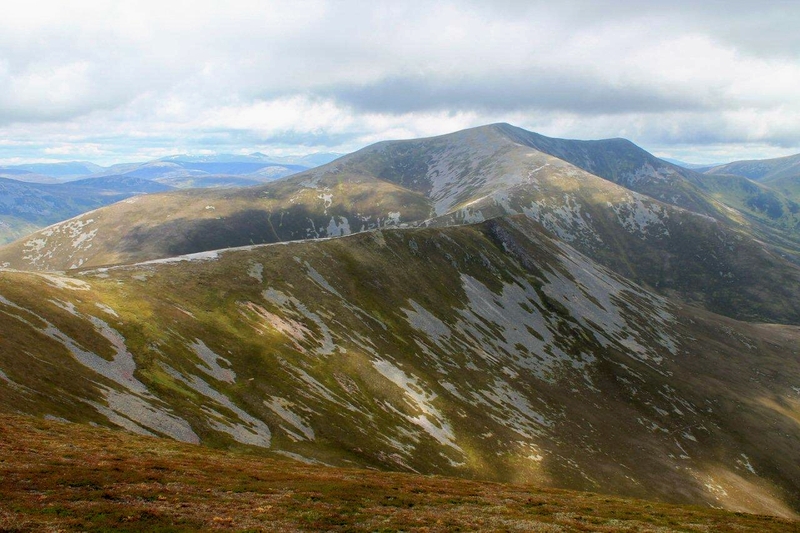 Carn Liath is connected by a splendid ridge to Bráigh Coire Chruinn-bhalgain – a bit of a brute at 1,070m (3,510ft). Then on the far side of a bealach, and turning its back to the civilised world, stands Carn nan Gabhar. This is the loftiest of the three Munros and it knows it. Carn nan Gabhar possesses attitude. It looks like a mountain that’s trying to be higher than its 1,1120m (3,674ft). Perhaps one day it might be. You can do anything if you try hard enough . 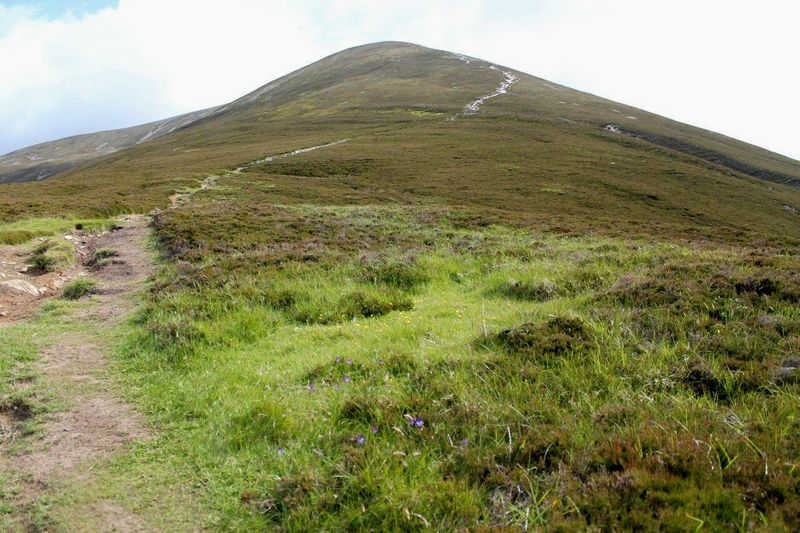 . .
I’m steaming up a path that zigzags up the front of Carn Liath and doing well because I’m in a bad mood, and that always helps. I paid £17.50 to camp at Blair Castle Caravan Park last night – yes, £17.50. That’s for me, my little tent and my little car. No thirty-foot leisure vehicle with electricity hook-up, satellite dish and patio option for a portable barbecue. Just me occupying a piece of grass too small to provide a day’s grazing for a goat. And the infuriating part of it, the bit that makes me really angry, is that I have reached the conclusion – rightly or wrongly – that a portion of that £17.50 is being squirreled away to finance a private army. Did you get that? Private army. Apparently, the Duke of Atholl, whose ancestral home is Blair Castle, is the only person in Europe to possess a private army. That’s really amazing. Because private armies are something we tend to associate with parts of the world where democracy and table manners haven’t penetrated. We British don’t usually go in for private armies – unless you’re an old Etonian or the disgraced son of a former prime minister. Then it’s almost mandatory. The duke’s private army, the Atholl Highlanders, has its origins in the 77th Regiment of Foot, which was raised as a relief for regiments serving during the American War of Independence, though it got no farther than Ireland. Nowadays it just turns out on ceremonial occasions – a bit of drumming and piping for the tourists and a bit of marching to air the kilts. Everybody likes that sort of thing and I’m no exception. It boosts the local economy and everyone has a memorable experience. So I’m huffing up Carn Liath thinking: I could do that. I could raise a private army and boost the economy of the Tees Valley (which used to be called Teesside before the corporate marketing and regenerating types moved in). It would be a multi-cultural regiment to reflect the population’s ethnic diversity, and it would boost tourism by marching from Darlington to Redcar twice a year while playing an assortment of musical instruments and singing the praises of various gods. My first step would be to apply for a National Lottery grant to purchase a batch of second-hand uniforms and obsolete weaponry from a sub-Saharan nation, just to give my multicultural private army that important veneer of authenticity. Would my application be successful? Or would my front door get kicked in early one morning by counter-terrorism officers from the Metropolitan Police? I think we know the answer to that one. Private armies are accepted by the establishment when they are owned by stupendously rich people, Bond villains and the clowns at G4S. The last word on this subject, for now, goes to Wikipedia, which states that the Duke of Atholl’s private army is inspected by its patron once a year “when the present duke comes from his home in South Africa”. Why does that line crack me up? That tirade’s got me to the top of Carn Liath. A good dose of blinkered working-class prejudice doesn’t half get the heart thumping and the legs churning. And the fact that I’m £17.50 lighter has undoubtedly helped, as well. 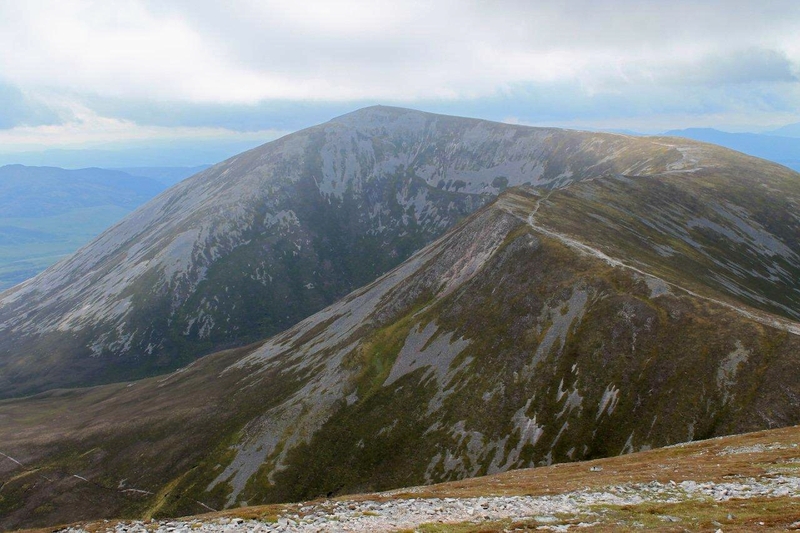 A tremendous ridge curves north from Carn Liath to Bráigh Coire Chruinn-bhalgain. 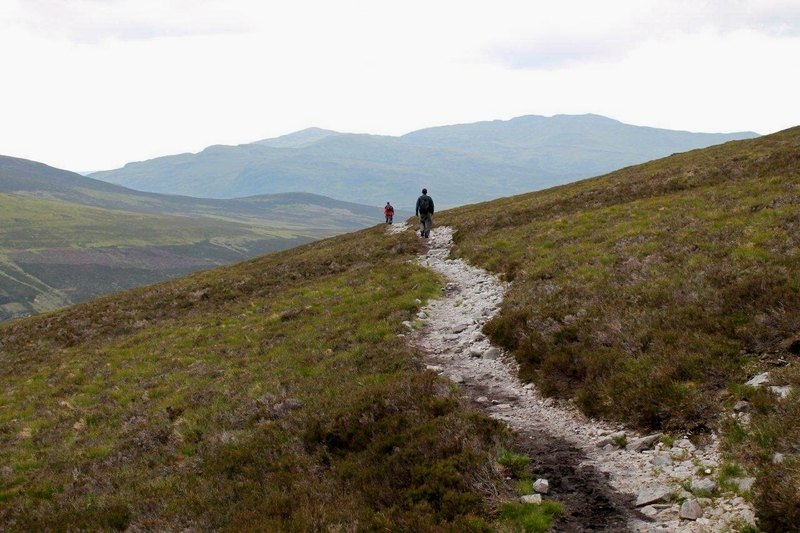 It’s a ridge where a bloke can march with the wind in his hair and whistle the Braes O’ Killiekrankie, while periodically gazing dizzily down slopes of scree onto wild moorlands many hundreds of feet below. 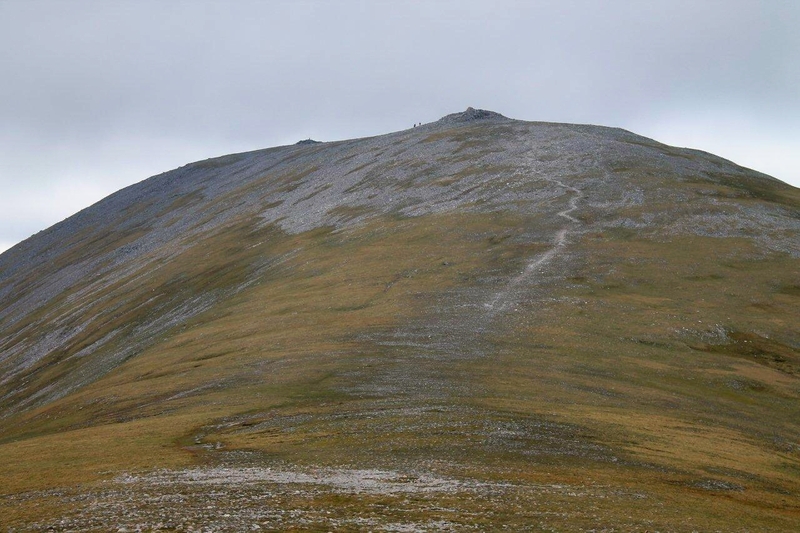 A steep and stony pull gets me to the summit of Bráigh Coire Chruinn-bhalgain, then I drop down a deep dip to a bealach and sail up another shoulder to the summit ridge of Carn nan Gabhar. This is real meaty stuff. The Atholl Highlanders, by the way, and from what I can gather, have never fired a shot in anger. This raises a question mark over their effectiveness as a private army. But they would almost certainly knock spots off Olympic guardians G4S, the dozy pillocks. Send the Highlanders down to London with an extra ration of oats, that’s what I say. And they could probably teach me a valuable lesson in getting down off Carn nan Gabhar, because this is where I come unstuck. The easy route, let me tell you in hindsight, is to retrace the path to the bealach and follow a good track south-south-east along the banks of the Allt Bealach an Fhioda to guaranteed salvation. 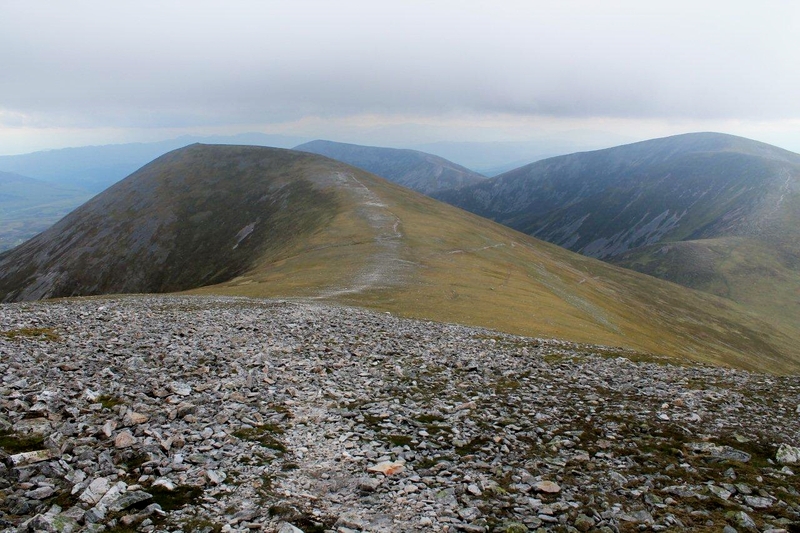 Instead, I continue along the ridge to Airgiod Beinn (1,061m, 3,480ft) and drop off the end – almost literally. Anyone with dodgy knees should avoid this route. From just beyond its summit cairn, Airgiod Beinn plummets to the heathland around its feet at the angle of a steep church roof. I am tempted to cling to the heather halfway down and have a late lunch, but I know that if I drop my boiled egg I’ll never see it again. A couple of thousand feet lower, where Airgiod Beinn begins to level out, I intercept the Allt Bealach an Fhioda track and follow its course across several miles of heathery heath to join the farm road back to Monzie, where I’ve left the car. One final observation. 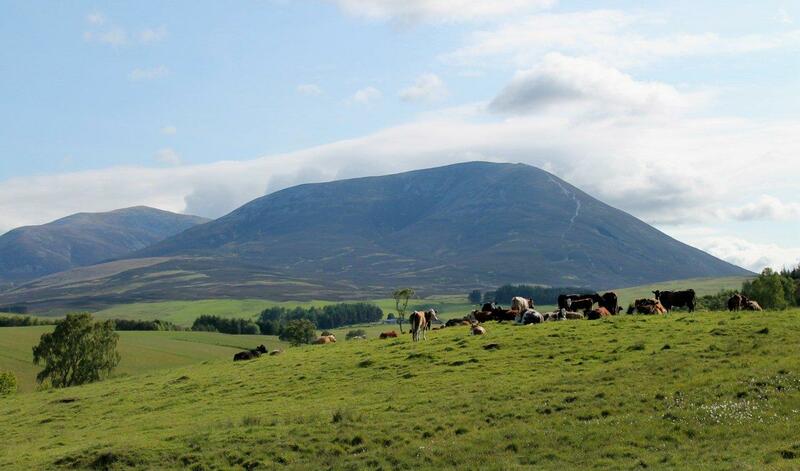 The approach to Beinn á Ghlo (which means hill of the veil of mists) is through high pastureland where cattle and sheep roam free. 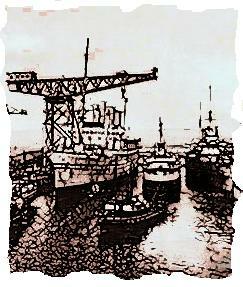 There are scatterings of woodland and peaceful lochans, and the remains of settlements dating back to prehistoric times. It really is the most pleasant of landscapes to wander through in the afternoon sun with the dust of the mountains and peat of the moors on your boots. This is the sort of place I’d like to live but can only dream about. Unless . . . I wonder if the old duke’s holding any recruitment drives? I used to be pretty handy with an air rifle. 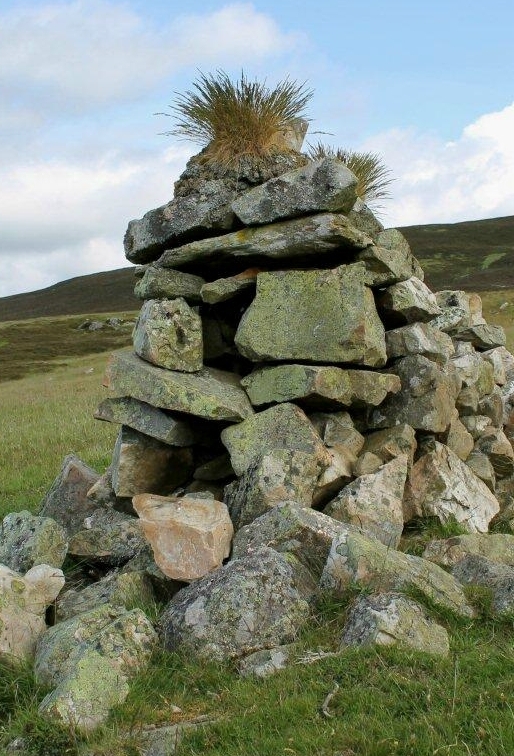 This entry was posted in Camping, Climbing, Environment, Hiking, History, Mountains, Politics, Ranting, Walking and tagged Cairngorms, Munros, outdoors, Scotland, The Munros. Bookmark the permalink. Hi Alen. I think you should consider opening your garden to the public. Then you could plant some rare trees, in order to protect the biodiversity. On this basis you can apply for funding in EU and become a wealthy man with a private army and your own public car park. I feel faint at the thought of all the opportunities waiting to be realised. An elevator down from the land-rover track to protect the knees that’s what missing. Feel free to ask if you need a partner. Hej Hanna. I think you have some good ideas there. I like the bit about opening my garden to the public. I’ve just bought four hens and built a pen for them, so perhaps I have the beginnings of a wildlife park as well. I shall look into the grants situation but it might mean me branching out into lemurs and Asian tigers. I could have done with that elevator, mind. That area seems to have a real prehistorically impressive look to it. Great photos and post! Hi Roxyboots. Thanks for the comment. The area has some of the oldest rocks in the world – carved and shaped by the last ice age. So it’s about as prehistoric as it gets. And that suits me just fine. You shouldn’t have explained the joke cos, unusually, I got it. You must be fit to do all 3 in one day as it took me a 2 night back pack. I did visit Loch Loch however and get eaten alive by midges. Hi Greg. I’ve stopped measuring the mileage I walk because I’ve found it gets less as the years go by. But this one I did in fact measure, and it was 14 miles. So if you visited the marvellously-named Loch Loch as well, you must have bumped it up to about 20 at least. That’s too much for me in one day over ground like that, so I would have split it up too. Thanks for the midge warning. That’s one to file away for future reference. Ah Beinn á Ghlo! I climbed these three Munros on a hot May day, wearing T-shirt and shorts, only two days after being in 4″ of snow and mist elsewhere in the area – such is Scottish weather. I had one of my best encounters with a mountain hare on the top amongst the boulders, it was content to watch me from very close quarters as I was to watch it! I did it the other way round and I remember the walk to the first bit of real ascent being a bit of a slog, and as I recall, a rather peaty dug out path at the beginning of the “up” bit. I didn’t know about the army though. Hi Colin. I can imagine it being a slog the other way around. At least the peat was pretty dry for me, so it was quite pleasant to walk out in a leisurely fashion and take the chance to unwind. I didn’t see any wildlife up there. Not a single thing. I once saw a whole crowd of hares on top of Tom Buidhe, though – about a dozen of them in a group. Strange animals. Isn’t it odd what can catapult you up a mountain! 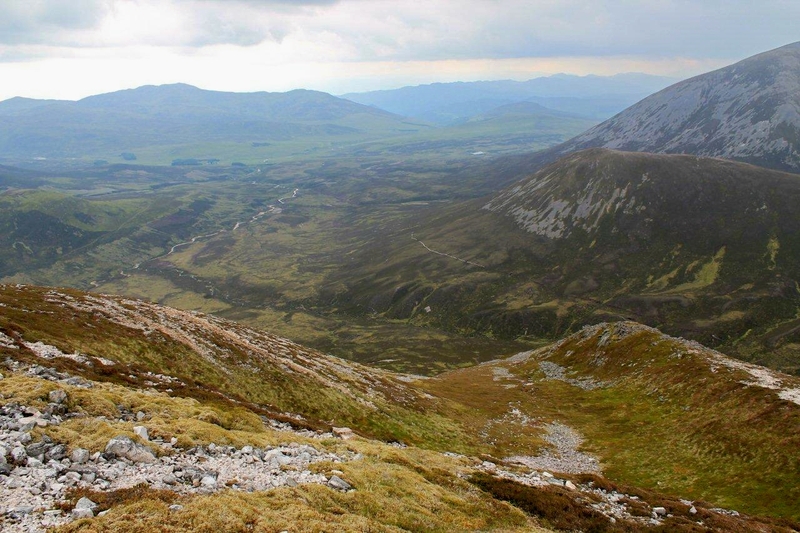 Another fine read, loved the Carn Liath ridge shot – it has trail me written all over it. “The End” sounded mighty steep Alen and Im sure weve all been there give or take a few thousand!, glad you and your boiled egg made it down safe. Hi Paul. Yes, that ridge is a really great walk. In fact, the whole group of hills is a great day out. It’s one I’ll look back on with happy memories. It’s about time you got yourself up there in that flash car of yours for a few days and knocked off some 3,000ft-ers. You’ll get hooked, you know. Mrs Potter, you are just too kind. Keep that wheel spinning and those fingers tinkling that keyboard. A grand trio of hills and decent weather to enjoy them, enough to lighten the mood I hope. I have just looked at my Munro book and I enjoyed a wander around these hills back in 1999 and 2000. Why I did Cairn Laith on its own in September and then returned to do the other two the following June I don’t know, probably not fit enough I suspect. I do remember them being grand days out though. Hi David. I’m glad you can’t remember why you did it in two walks because I do things like that. I’ve got a 1970s inch-to-the-mile Ordnance Survey map of the Lake District with all my walks marked on in biro – but I look at it nowadays and can’t remember half of them. 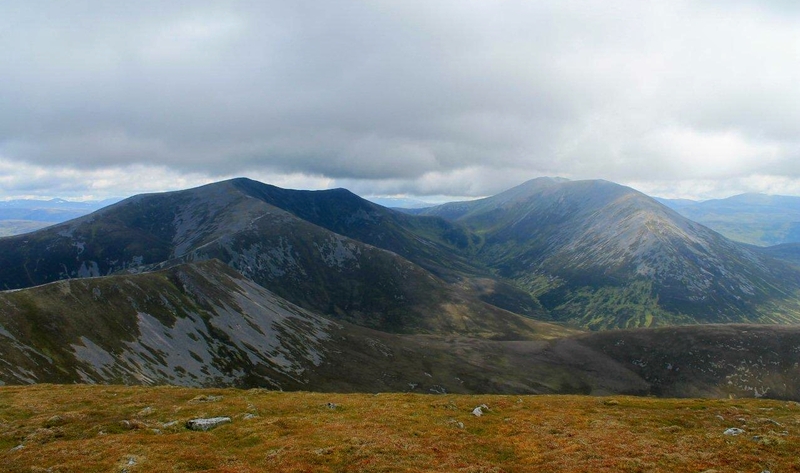 I’ll remember Beinn á Ghlo though – a classic day out. Great post and photos as ever Alen. Only problem now is that everytime I watch the Olympics I find myself looking for a security guard dressed as an Atholl Highlander! That would be great though wouldn’t it. Hey John. You know all this controversy about the Army stationing ground-to-air missiles on blocks of flats in the East End? Well if you watch the BBC Olympics coverage carefully when they’re reporting from the studio, and you look at the roofs in the background, you can just make out four blokes with muskets and a cannon. No Kidding. Great stuff. I think your own army is the only way to go. £17.50 sounds extortionate to me too! I like the way you ‘sailed up another shoulder’ – I would have been flagging at that point! The views are just stunning. Hi Jo. Yes, £17.50 is the most I’ve ever paid to sleep on the ground. But as ground goes, it was pretty comfortable. And now I’ve had time to reflect, perhaps “sailed up another shoulder” sounds a bit over-enthusiastic and not an accurate reflection of events. “Shuffled up another shoulder” doesn’t have the same ring to it, though. There is a town called Atholl in western Massachusetts, U.S. that I lived near back about 85′ with no private army there to punish those that referred to it as Ath Hole. Great pics and another sad reminder that must simply do something more to get these legs of mine back in shape. Aloha. Hi Dohn. That’s interesting about the Massachusetts Atholl because when I was researching this post I stumbled on the website of the Atholl Highlanders Pipes and Drums Band (USA), but they come from Stone Mountain, Georgia. So I guess, like a lot of things, seeds and ideas and traditions have been scattered far and wide, and some have taken root. I like stuff like that. Can’t do anything for your legs though – I have enough trouble with my own. I know it was making you angry, but I confess I was laughing at your classic fulminating over the price. Would it cheer you up at all if he maybe needed the money not to pay for his personal soldiers, but to fix his clock tower? I mean, I hate it when my clock tower catches fire. If I’d known that before I pitched my tent I would have made a donation to the restoration fund – perhaps rounded up the payment to £18. A chap shouldn’t be without a clock tower. But wouldn’t you have thought that a man who runs a private army would have had a private fire brigade as well? Anyway, I’m glad you popped by, Scott. Something in the back of my mind told me that you camped there during the winter months and recommended it, so before I went I searched your blog for the details but couldn’t find the post. I might be wrong, it might have been somewhere totally different you stayed, I was just under the impression it was Blair Atholl. When I got there I discovered there are two campsites, so I just plumped for the one that looked most tent-friendly. Luckily for me it had its own army so I felt safe enough, that’s for sure. Hmmm. I’ve definitely camped there once, but I’m struggling to remember the ins and outs. I can remember the cost, right enough. It may actually have predated the blog altogether. There was a separate occasion when a couple of the chaps I was meeting up with declined to stay there because it was £15 per night with a two night minimum(!) – we ended up at Faskally in Pitlochry. That’s it. I even left a comment. Not only did I get the wrong campsite, I got the wrong place. Mind you, Blairgowrie does sound like Blair Atholl to the untrained ear. A damn site more reasonable at £8 a night, as well. Shame about the extortionate prices, I have very happy memories of that campsite from the days when my priorities for a campsite included swings etc. Now they do again! I seem to remember that the Witches Hat was particularly fine. And huge. Where does one sign on the dotted line for your private regiment? I’m up for that. Although I’m not very ethnically diverse. Except – I’m English, from Lincolnshire – a bit of Saxon, a bit of Dane, maybe some Dutch, allegedly some Romany. I take that back – I’m a proper mongrel: you need me! Also, I have a bugle (my Granddad’s) and can occasionally get a note out of it. I await the call up…..
Mark, you sound like perfect material to take the duke’s shilling. I expect he’ll be in touch. I am envious of your ability to play the bugle, mind. I’ve never been able to get a single note out of anything made of brass. I think my head must be the wrong shape.